According to the Federation of Small Businesses (FSB) and iwoca in the U.K, that equates to the loss of 15 working days a year and £5,000 GBP (approximately $8,500 CAD) to tax compliance activities. More than a quarter of business owners who responded to the survey said that bookkeeping is among the greatest hassles when running a company. Small business owners should be encouraged to hire professional bookkeeping services so they can better focus on building their business, and minimize liabilities and penalties for late filing and improper records as required by the CRA. But it’s really difficult to find a great bookkeeper, said executive coach Jenifer Bartman at the recent Business Builders Retreat in Quebec City. Fortunately, bookkeepers with the DFA-Bookkeeping Service Specialist credentials have broad and deep knowledge to compliment software skills. Highly qualified bookkeepers offer a number of important benefits to any business, but perhaps the most essential is keeping accurate books for the completion of audit-proof corporate income tax returns. This comes at a time when CRA service standards for small businesses are in question, and audit activity is up. Meanwhile, new legislation for writing-off equipment and the recording of family members’ activities in the business keeps adding complexity to this process for owner-managers. 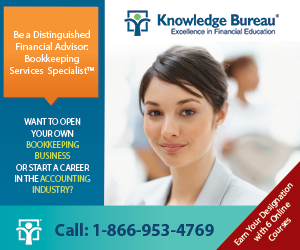 Check out the DFA-Bookkeeping Services Specialist designation to obtain the knowledge and skills to complete accurate books based on accounting principles and tax compliance necessary throughout the evolving lifecycle of a business. The program places a heavy emphasis on tax planning for payroll, owner-manager compensation, GST/HST, managerial accounting, budgeting, cash flow and debt management and a strategic focus on analyzing the numbers for growth and eventual high-value transition. Course substitutions are possible. Six completed courses are required to earn a designation. Additional educational resources: Prefer to learn in-class from expert instructors? Attend the CE Summits this January in any one of six Canadian cities for an advanced personal income tax update that will help bookkeepers and business owners confidently prepare clean and accurate corporate books in the 2018 tax season.